The Gospel of the Fifth Sunday is perhaps the deepest meditation on the mystery of Baptism and membership of the Church. It is a prelude to the events of Easter Sunday, when we celebrate the triumph of life over death. To be plunged into the waters of baptism is to be buried with Christ, only to rise with him from the waters. This paradox of life and death is the content of todays readings. There is no more important part of our faith that the resurrection: that Christ rose from the dead is the very centre and heart of all that we believe - without it, our faith is useless. In the same way our belief in our own resurrection is vital: it is the most deeply needed gift that Christ gives us. This is why the climax of the instructions given to candidates for Baptism was this teaching: that Christ would give them life after death. 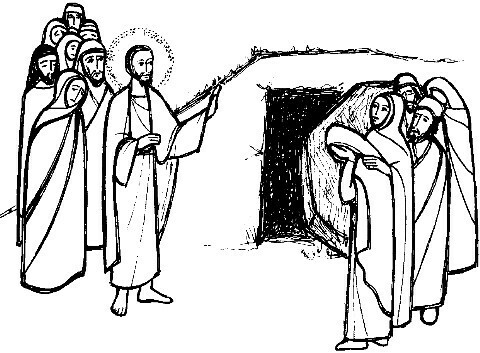 Look ahead to the 3rd Sunday of Easter, where Saint Peter preaches to the crowds  what he teaches them is that life comes after death, as it did for Lazarus, and for Christ himself. 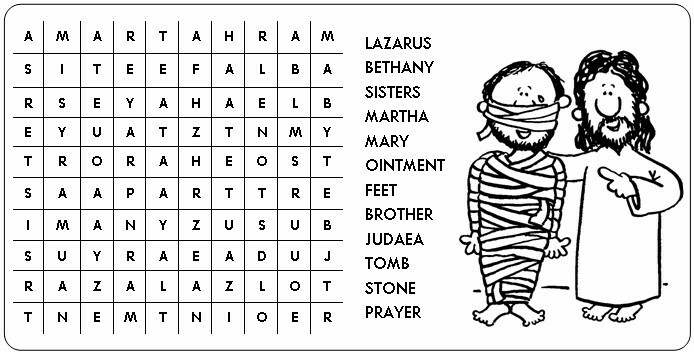 "The practice of covering crosses and images in the church may be observed. The crosses are to be covered until the end of the celebration if the Lords Passion on Good Friday. Images are to remain covered until the beginning of the Easter Vigil." The Season of Lent grows and develops: a significant shift happens on Monday of the Fourth Week, when we suddenly find ourselves reading through passages from <?xml:namespace prefix = st1 ns = "urn:schemas-microsoft-com:office:smarttags" />Saint John's Gospel. This semi-continuous reading continues until Good Friday (with the exception of a Gospel from Saint Matthew on the Wednesday of Holy Week), when we gather to hear and celebrate the Passion as related by Saint John. These last two and a half weeks of Lent invite us to focus more vividly and devotedly on the cross of Jesus: the passages selected from Saint John all talk of the growing opposition between Jesus and the Jewish leaders, and their desire to see him silenced. They lead us more and more energetically towards the cross. This is a development of the ancient part of this Lenten Season known as "Passiontide", which used similar Johannine readings describing the hostility towards Jesus. What we now call the Fifth Sunday of Lent used to be known as "Dominica De Passione", not because the Passion was read on that day (that happened, as now, on Palm Sunday), but because it marked the beginning of a different focus in Lent. Having begun in ashes, and concentrating on the path of repentance with the aid of prayer, fasting and almsgiving, the Church now adds to that journey an emphasis on the Passion and Death of the Lord. This emphasis, or concentration, was marked by an increase in the austerity and atmosphere of Lent, as familiar statues and images were hidden from sight by means of violet veils. Even the crosses in church were veiled, leaving only the Stations of the Cross for devotion ... or distraction. This gave a special importance to a part of the Solemn Good Friday, when the cross that was to be venerated was solemnly unveiled. This practice may still be observed in our Diocese, and there is much to recommend it. Lent is our annual wilderness, our forty day journey with the Lord through the desert. Fasting and Abstinence, as well as other acts of prayer or penance, are to create that wilderness in our lives - a freedom from distraction, from the busyness of material things and the preoccupations of this world - so that we may discover God's closeness more vividly, more strongly, more perfectly. As statues and images are veiled in Church in these last days of Lent, we feel a sense of emptiness. We have already been without flowers for more than four weeks - now even our statues of Saint Patrick and Saint Teresa and Saint Anthony of Padua are veiled, and we walk into Church and feel a desolation. As the old Saint Andrew Daily Missal said: "Thus the interior of the Church, where so many graces are bestowed on the faithful, and worship is celebrated with a certain pomp, takes on an aspect of unaccustomed mourning." But this is an emptiness and desolation that Christ waits to fill: even if our images and crosses are veiled, we do not veil his presence in our midst. Indeed, we are invited to focus more and more on that heavenly gift which is the presence of Christ in our world. We empty ourselves of distractions, so that we can focus all on Christ, who gives all for us. It is fashionable nowadays to talk about the "Liturgical Environment" - we use our senses of sight and touch and smell when we come into Church, to be lifted up in prayer. The veiling of images and crosses may seem to be a relic of the past, but if done well is still an effective jolt to the liturgical senses: it makes us stop and ask - Why this emptiness? Why all this sombre purple? What are we celebrating? When the Lord says I am going to open your graves these words really are addressed to us, no matter how chilling they may sound. This is the promise of the resurrection we will explore in Easter - that just as Jesus died and rose again, so - because we are baptised in him - we will die and rise again. This is the doctrine of the Resurrection of the Body which we proclaim in the creed. So in reading, do not stumble over those words of God: allow them to ring out confidently each time they occur. The promise of life from the grave is our greatest Christian hope. Also, a confident proclamation of this reading will open hearts to the dramatic message of the Gospel. Saint Paul adds to Ezekiels prophecy by telling us that it is the Holy Spirit (given in Baptism) that guarantees this rising. Again, as we have seen throughout these Sundays, Paul is using contrasts: spiritual-unspiritual, life-death: bring these out in the reading. As with all these contrast readings, take your time: allow one half of the contrast to sink in before you go on to the other: for example: Your interests, however, are not in the unspiritual /pause/ but in the spiritual... Remember that when you use the word you or your it speaks to the congregation in front of you. This is Gods living and active word being proclaimed and talking to us here and now. If possible, be confident enough to look at the listeners when using the word you.